A bid by an NHS trust to merge with a neighbouring one that faces a huge debt would be "suicidal" without financial assurances, a health critic says. 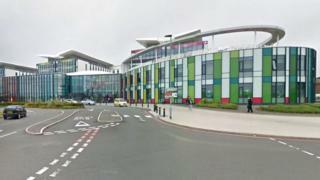 Nottingham University Hospitals NHS Trust has bid to take over neighbouring Sherwood Forest Hospitals NHS Trust. Mike Scott, of Keep Our NHS Public, said the move would need "copper-bottomed" financial guarantees. Derby Teaching Hospitals NHS Trust is also bidding to take over the running of the Sherwood Forest trust. Mr Scott said: "It is not like a crisp factory where one closes down and you can go somewhere else. If a hospital closes down... people will have to go long enormous distances." Sherwood MP Mark Spencer said "some government cash" would definitely be needed to "take the pressure off Sherwood Forest Trust". BBC East Midlands political correspondent Peter Saull said both trusts believed a takeover meant "some of [their] debt would be paid off by the government". The Sherwood Forest trust already pays more than £3m a month in payments as part of a Private Finance Initiative (PFI) deal that will cost £2.5bn over the term of the agreement which runs until 2043. Dr John Lamport, of the National Health Action Party, said he welcomed a merger on the grounds of "economics of scale". The Sherwood NHS trust, which runs King's Mill, Newark and Mansfield Community hospitals, was put into special measures in 2013 two years ago because of concerns about mortality rates and standards of care. Last year the Care Quality Commission (CQC) said there were still "serious problems" with death rates and care standards at the trust. A decision on whether a merger will proceed is expected to be made by the health watchdog Monitor in the next few weeks.